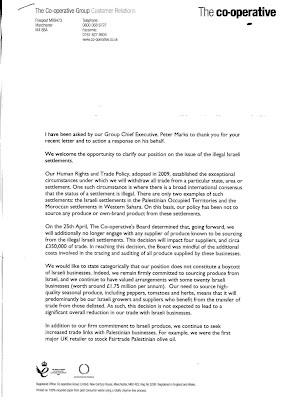 In response to the Co-Op's well publicised decision to boycott all goods from 'illegal Israeli settlements' I withdrew all the money I had in a Britannia building society account (Britannia is part of the Co-Op) and wrote a letter explaining why. 1. ‘Occupation’ is the only criteria that you mention; what other criteria do you have as part of your “Human Rights and Trade Policy”? 2. Is denial of equal rights to women and/or minorities included in your criteria, and if not why not? 3. Is persecution of gays and lesbians included in your criteria, and if not why not? 4. Is the brutal suppression of ethnic minorities and political dissidents included in your criteria, and if not why not? 5. Is sponsoring and glorifying terrorism included in your criteria, and if not why not? 6. Is state sponsored anti-Semitism included in your criteria, and if not why not? 7. Assuming the answer to at least one of questions 1-6 is ‘yes’ then why are you not boycotting goods from every one of the 58 Muslim countries in the world? 8. Is “conducting illegal wars far from a country’s own borders” one of the criteria, and if so why is the Co-Op not boycotting goods from the USA, France, Italy, Holland etc. In fact, how comes the Co-Op is not boycotting goods from the UK? 9. Are you aware that, even according to the United Nations (resolution 242), the West Bank does not belong to any national territory but rather is considered disputed territory whose borders are to be determined under a final status peace agreement? 10. Are you aware of the recent Levy Report that demolishes the false narrative of Israeli settlement and occupation by restating many of the obvious points of law; most significantly that Israel is not an occupying power and did not seize any land from another state. Indeed all of the land that Israel is accused of occupying in the West Bank is actually land that was seized from it by the invading Jordanian and other Arab armies during its 1948 War of Independence? 11. Are you aware that the only legal basis for denouncing the Jews who returned in 1967 to the homes that they had been expelled from in 1948 as “settlers” is by recognizing the Jordanian conquests of those territories. But those conquests were never recognized or accepted. Not even by the international community. 12. Assuming that your claim of a ‘broad international consensus’ is the 2004 International Court of Justice ruling (which Israel did not participate in and which has been demolished by the Levy report) are you aware that one of the ICC ‘judges’ was Al Khasawneh who had a blatant conflict of interest, since he was an advisor to the King of Jordan and later became the Prime Minister of Jordan? 13. Why does your notion of occupied territories fail to include the approximately 160 other territories around the world that are ‘disputed’ (each of which necessarily involves one country ‘occupying it’ against the wishes of some other country or national group)? 14. In particular why does your definition not include genuinely brutal occupations such as: the Chinese occupation of Tibet, the Turkish occupation of Northern Cyprus, or even the Russian occupation of Abkhazia, especially as China, Russia and Turkey all of have infinitely worse human rights records than Israel? 15. You are presumably aware that one of the disputed international territories is the Falklands Islands, which Argentina claims is illegally occupied by the UK. A significant majority of countries in the UN now agree with the Argentine position. So, as per question 8 above, why is the Co-Op not boycotting the UK? 16. Are you aware that any notion of an ‘international consensus’ is fundamentally irrelevant because the United Nations contains 58 Muslim states – all human rights abusers as described above - who provide a built-in ‘consensus’ on any anti-Israel motion that anybody cares to think of? 17: How is the Co-Op’s “Human Rights and Trade Policy” consistent with seeking increased traded with such a brutal, corrupt regime? 18. Do you believe that Israel – the only liberal democracy in the Middle East where all minorities have equal rights – is a worse human rights violator than Syria, Iran, Pakistan, Saudi Arabia, the Palestinian Authority, Bahrain, Egypt, Jordan, Russia, China etc? 19. How is your policy to boycott goods produced by Jewish communities in the West Bank anything other than pure anti-Semitism? 20. How and why did the Co-Op get hoodwinked into a nonsensical hypocritical policy (that will ultimately be self-damaging) by a small group of congenital anti-Semites disguised as ‘pro-Palestinian’ activists. UPDATE 10 Sept 2012: See here. Excellent post Mr. Davidson and excellent letter. Thank you for updating me on my own blog. I look forward to hearing what reply (if any) you receive from the Co Op. You of course will never receive a sane or coherent answer to your questions. Either she'll say "I was just following orders" or "We evaluate everything on a case by case basis" or some such twaddle. You know that, don't you? I also wrote to the Co op to complain about the boycott. I received the identical letter back from M/s Customer Relations. 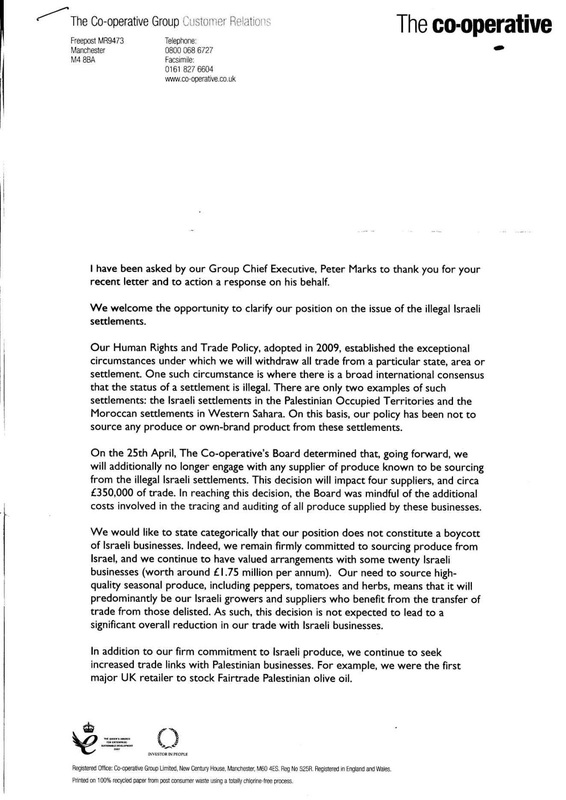 I wrote back to explain that it would be the Palestinian farmers who would suffer from this boycott. In return I received another copy of the first letter. Quite a put down. As one BDS opponent to another, I congratulate you on an excellent piece. So clearly statement. You did a great job. 1) But the US is providing billions of my tax dollars for finance the occupation and the suppression of Palestinians. 2) But we have been asked to support this cause by Palestinian Civil Society. If the Tibetans asked me to boycott China, I would do it. 3) But occupation is unique. 4) Just because I can't help everyone doesn't mean I shouldn't help some. 4) As a Jew, I feel a special obligation to speak out against Israel's excesses/transgressions/atocities (pick one). P.S. - I got it that Free Palestine Now is a satire site. Is Fiona Warburton a real person or nom de plume. I expect that, like Eddie, I will get back exactly the same letter as the first. In that case I will write direct to the CEO Peter Marks saying that the person he delegated the response to has not answered my questions. To "Stop the BDS Park slope"
Interesting that in the US there is something of an altruistic reason for 'supporting the Palestinians' (as you say as in "we have been asked to support this cause.."). It is never that in the UK. The people involved in the BDS movement here have no interest in helping the Palestinians. They are plain and simple anti-Semites. Indeed they are. I've been looking systematically at some of their comments on Facebook. Some, including a prominent BDS activist in London, are totally obsessed with vilifying Israel, and do so in ways which easily identify them as Jew-haters. And the comments left on their posts are quite astounding. Many of their Australian counterparts are as vicious. Needless to say, an extremely high proportion are leftists, and yet despite being avowed progressives they will not tolerate any criticism of Islamic views and practices. Many of their comments re "Zionists" are stomach-churning, and the total ignorance of Jewish and Israeli history, and eagerness to swallow the enemies' lies, is mind-boggling. I assume Ms Warburton is now working for the Guardian, Edgar! Yes, I see Ms Warbuton has updated her profile. menudo puede ver, muchas gracias! Visit free weekly news of Israel's achievements at www.verygoodnewsisrael.blogspot.comand be amazed at what Israel is doing in the world.